Arctos Jigs — Simple Bicycle Co. Originally designed by Gary Helfrich over twenty years ago, the Arctos Jig has been refined and improved and is now one of the best jigs on the market.Whether you’re a hobbyist or a professional builder, the Arctos Jig will suit your needs. Arctos Jigs are dead simple, rock solid jigs designed to be easy to use and built to last. The jig can easily be set up to build nearly anything. From a micro mini BMX frame to a 29er tandem, the jig can handle it. Any bb style, any tubing, any head tube size, any welding technique. Adapters are available for most bottom bracket shell styles. Dummy axles for track, road, and mountain spacing ship with the jig; BMX and 150mm are available separately. An easily installed tandem add-on is also available. Arctos Jigs make it easy for you to build the frame you want without compromise. Each jig is built on a backbone of super-stiff T-slot aluminum extrusions. Each adjustable fixture is designed with maximize surface area contact at its juncture point in mind ensuring rigidity. The result is a rock-solid jig that won’t budge. All of this rigidity means frames are precise, require less alignment after build, and have less tension built in. The jig is easy to setup. 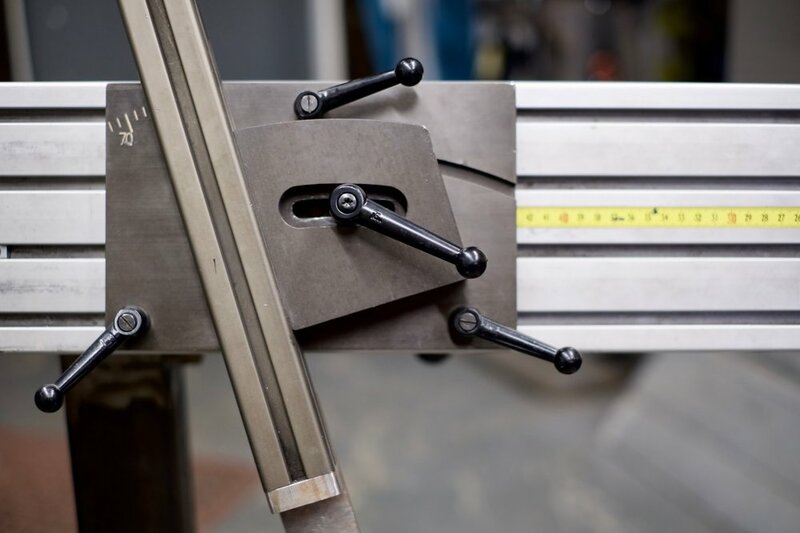 Draw up your plans and use the clear calibration marks to transfer your design to the jig. No special calculations or formulas. The jig is easy to use. The designs provides plenty of access to the frame. The mount allows 360 degrees of full, uninterrupted movement. You can weld any joint from any angle, any position. The simplicity of the design allows you to spend less time fussing with the jig and more time building frames.